As it is Halloween, here is a Halloween Gambit to celebrate. While played during a rapid event, both players were pretty decent, so it may teach you something. You can learn a lot just by paying attention. Or in the world of chess, by studying the classics. This was made particularly clear to me at the club tonight, when I managed to win a nice game by borrowing a strategy off Capablanca. Having damaged my opponents kingside pawn structure (doubled f pawns after BxN on f3), I locked his dark square bishop out of the game. Then with the 'extra' piece I shifted over to the queenside to reach a winning ending. The Steinitz Gambit usually occurs in the Vienna Opening, after 1.e4 e5 2.Nc3 Nc6 3.f4 exf4 4.d4!? Qh4+ 5.Ke2 It is correctly named, as Steinitz played this line on plenty of occasions, although not always with plenty of success. There is a line of the King's Gambit, also named the Steinitz Gambit, which is the same line as above, but with the knight moves removed (1.e4 e5 2.f4 exf4 3.d4?! Qh4+). This was the line I witnessed at a junior event today, although White went wrong with 4.g3? Black missed the obvious win of a piece after 4 ... fxg3 5.Bg2 gxh2+ 6.Kf1 Qf6? and White eventually won after finding a nice forced mate which involved a queen sacrifice. But as the game was too 'up and down' to show the full power of the opening, I've chosen a different game instead. If you aren't satisfied with the current crop of chess clocks, you can always build your own. Using some inexpensive electronics, plus a set of instructions found here, you can make your own. They even supply pre-built clocks, which still gives you the ability to write your own control code. While electronic clocks are now quite common place, the one piece of code I would be interested in adding/testing, is the ability to set a time via a wifi/bluetooth interface, cutting down on the time required to reset clocks at the start of each round! As Australia lacks a proper national team competition, it looks as though the 4NCL (UK) is the next best thing. I have a connection with the White Rose team (as a sponsor, and very bad player), while the manager is Rupert Jones (who carries an Australian passport). Another team with a strong Australian connection is the Celtic Tigers. They are managed by Chris Skulte, who was an active player on the Australian scene, before work carried him off to Europe. Their top team played in 4NCL division 2 last season, but a second place finish sees them promoted to Division 1 for the new season. Building on this success, they are now adding a second team in Division 4, to provide more opportunities for new players (including David Webster, another wandering Sydneysider). They have an excellent website, providing coverage of all their adventures (both on and off the board). There is also a newsletter produced every couple of months, which can be downloaded from the site. One of the sins we commit as chess players is taking advice as 'read'. For as long as I can remember 9.d4 is the main line of the Ruy Lopez was not recommended, 'because Black plays 9 ... Bg4'. Instead 9.h3 followed by 10.d4 is considered best. However, handled the correct way, playing d4 before h3 is probably as good as the main line. I tried it in my final round game of the Olympiad, and had quite a good position, until I fell apart after move 30. And going back 100 years, Capablanca showed and instructive way of handling the position, albeit in a slightly different line. Allowing the bishop to go to g4, before hitting it with h3, gives Black the choice of returning along the diagonal, or moving back to h4. This was the choice of Capablanca's opponent, whereupon Capa played g4 (not worrying about king safety) and shifted play to the queenside, with Black effectively a piece down. This year the team that did best out of this set of countries was Guam, who scored 8 match points (Fiji and Solomon Islands did not send a team). This was extra impressive as they were seeded 181st, with just one FIDE rated player on the team. Apart from a 4-0 loss to Iraq in the first round, they scored something in each of their matches, and they defeated Central African Republic and Mauritius along the way. Four other drawn matches moved them ahead of their Pacific rivals, with a last round 2-2 against Ghana being the most important. They scored 18.5 game points, with Elmer Prudente on Board 1 finishing with an impressive 6/11. He was ably supported by Roger Orio on board 3, with 5/10. As a follow up to their good performance in Batumi, the federation is hosting the 2019 Oceania Zonal. This will take place between 18th and 24th February 2019 and is open to all players registered with Oceania federations. Billing itself as the strongest Open tournament ever, the 2018 Isle of Man tournament has begun overnight. The top half starts at around 2450, and board 37 saw an all GM pairing, so maybe the claim is true. What is clear is that the top 20 players had to work to collect their points, and half points. Nine of the top twenty pairings were drawn, which is remarkable given the 20th seed is Boris Gelfand (2701). While there were no upset wins for lower rated players in this group, Viswanathan Anand looked to be quite a bit of trouble against young FM Raunak Sadhwani before turning the tables to grab a full point. The start times are a little inconvenient for live viewing from Australia (east coast at least), but if you wish to stay up past 12:30 am you can see all the action via the tournament website. Congratulations to IM Guy West for his win in the 2018 Chess Train tournament. This was an 11 round rapid event played over 5 days in a few countries in Europe. The players played 2 rapid games a day, while travelling on a train from Prague to Warsaw and back. The trip looked very popular, with over 100 players taking part. Apart from West, Australia saw FM Tim Reilly, Sean Watharow and Jean Watson forming the victorious Aussie Wood Ducks team. Full results are here. For a quite long time FIDE were very keen to have teams (and players) adhere to a dress code in important events (eg Olympiad, World Cup etc). At first it looked as though they were going to be quite heavy handed on the matter, but of late, it seems that they were happy to let federations set their own standards. In practice, most federations at the Olympiad supplied their teams with some sort of uniform, and the standard of dress was reasonably high. Australia was an exception to this (as in the uniform wasn't paid for by the ACF), while Rupert Jones (PNG) seemed more comfortable playing in t-shirts and stretch pants, rather than the PNGCF polo shirt work by the rest of the team. 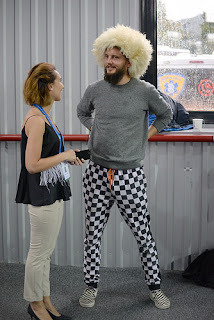 The recently completed European Club Championship had a similar dress code, although Magnus Carlsen was a notable refusenik (at least for a few rounds). Early on he, and a few other GM's, played in shorts, despite this not being allowed. Eventually the word was given that the dress code was being enforced, and long pants became the fashion. Personally I prefer to see dress code 'guidelines' rather than 'regulations', leaving it up to the players to decide what is appropriate. Not every team at the Olympiad had a uniform, but those that did not still managed to play in what I thought was perfectly acceptable outfits. Certainly there did not seem to be any issues at the tournament, and for me, this is probably the best way to go. During the 2018 Olympiad I was only able to catch small glimpses of the action in the main hall, and so I missed one quite significant result. Fabiano Caruana scored an impressive 7/10 on Board 1 for the USA, with a TPR of 2859. He played a number of the worlds leading GM's along the way, with wins over Anand and Mamedyarov being the standouts. This result is even more impressive, as it is quite possible that he 'held back' on some of his openings, keeping them up his sleeve for his match against Carlsen. Looking at these results and games, I think the upcoming World Championship match is going to be a lot closer than I originally thought. Caruana has a real chance of taking the title now, and Carlsen may even be a slight underdog. Carlsen is playing in the European Club Championship, and had a lucky escape in round 6 against Liren Ding. He missed a tactic against Ding, and only some resourceful defensive moves saved half a point. If he makes a similar mistake against Caruana, then he may not be so lucky. The 2018 Vikings Weekender is being held on the weekend of the 17th and 18th November 2018. This is one of the three big weekend events held in Canberra, and is being sponsored by the Tuggeranong Vikings Rugby Union Club. This year the tournament will be held at the Lanyon Club (Heidelberg St, Condor) located next to Lanyon Shopping Centre. It is a larger venue than last year, allowing more players and a more comfortable setting. First prize is $1000 for the Open, with a $500 first prize in the Under 1600 section. There will be 7 rounds, with a time limit of G/60M+10s in both sections. Entry is $65 (GM's+IM's free), $45 for concessions and juniors. One of the many things done well at this years Chess Olympiad was the production of a number of good videos. Some were played at the closing ceremony, while others are available on the Olympiad Youtube Channel. One highlight of the closing ceremony was the performance of 'Oh Capablanca' by Juga. You can watch her performance in the clip of the closing ceremony, or just listen to song directly. Congratulations to Joshua Lee for winning the 2018 ACT Junior Chess Championship. He scored an impressive 8/9 to win the FIDE rated tournament, a full point ahead of Lachlan Ho, Yizhen Diao and Ruofan Xu. He only looked in difficulty against Ho, and a quick last round draw against Dexuean Kong was enough to capture the title. Athena Hathiramani was the best placed female player, in an event which had a female entry of a little over 25% Erin Milne tied with Hathiramani and won the Under 12 Girls trophy. It was interesting to see the difference in results between players with a FIDE rating and those without. The FIDE rated players beat all their non rated opponents (with the exception of a single draw), even if they had worse positions during the game. Clearly the experience at playing at a higher level comes in handy in situations like this, as the 'saves' were often due to their opponents eventually losing concentration and blundering back. There were 42 players in the tournament which was a healthy number for an event like this. The majority of players were aged under 12, so hopefully this group will provide the next generation of ACT champions. The PNG performed quite well at this years Olympiad, and a significant amount of credit has to go to the team captain, GM Elshan Moradiabadi. We finished with 20.5 game points, which is the highest total we have ever achieved in an 11 round Olympiad. Apart from an opening 4-0 loss to Belgium, we scored something in every match, and had a few narrow 1.5-2.5 losses which could have gone the other way. Elshan quickly realised we were all either rusty or inexperienced so was quick to tailor his coaching methods to suit this. His opening preparation was very thorough, and he was able to show us a number of surprise lines in well known openings. In almost all games we achieved playable positions going into the middlegame (which was what he was aiming for), although we (as a team) didn't always do such preparation justice (I threw away a number of good positions for example). He was always upbeat even we were sure we had crushed his will to live, and proved to be an inspiring captain and coach. As a professional player, coach and author, he went straight from the Olympiad to take part in the St Louis Chess Club Fall Classic. With little rest, and running a bit of fever, he was still able to hold it together to score a very good round 1 win. Playing through the game I was struck at the winning approach he used in the game was very similar to what he was trying to teach us. He achieved a stable pawn structure, with extra space on the kingside. He then found the best squares for his pieces, before launching a winning kingside attack. tl;dr Dvorkovich ran a better campaign and had a better message than everyone else. I found the 2018 FIDE Campaign quite interesting, although I was a little surprised at the outcome. I was much more involved this time, as I was assisting Paul Spiller in his run for Oceania Zone President, and this turned into more general assistance to Nigel Short in his campaign for FIDE President. In the lead up to the Olympiad I was spending a lot of time ringing Oceania Federations (or at least trying to), and exchanging emails with the campaigns and federations. From the outset PNG was not going to support the Makro ticket, as a consequence of what had happened regarding the PNG delegate in 2014. ("What do you think we were going to do?" was a comment I made to more than one person). Our position was therefore Short on the first ballot, and Dvorkovich on the second ballot if necessary. And initially I thought that Makro was going to win, based on the techniques used in 2014 (lock federations in early, bully/promise delegates with offers of positions, run the election in a way that favours the incumbent). However once I arrived in Batumi things began to change. It became clear after the first few days that the Dvorkovich campaign was in this to win. The PNG delegation was invited to meet Dvorkovich after one of the rounds, and arriving at the suggested restaurant, noticed there were probably over 100 people of other federations in attendance. Nonetheless he spent a good 45 minutes talking to us, taking note of out suggestions. At this point I realised that the election was going to a lot closer than the FIDE ticket had hoped. In the expo area of the Olympiad both the Makro ticket and Dvorkovich ticket had stands. (There was no stand for the Short ticket as 'insurgents don't do stands!') While the Dvorkovich stand was putting out the positive message, the Makro campaign was running on the other tickets negatives (including producing some awful propaganda cartoons attacking the other candidates). The Makro campaign had also attempted to counter the well financed Dvorkovich ticket by trying to outlaw the giving of gifts etc (which had been a standard campaign technique for Makro etc previously). This was ignored and a number of federations availed themselves of the Dvorkivich goody bag. Meanwhile the Short campaign was chugging along, mainly working on the other delegates during Breakfast, Lunch or Dinner. Short was working on the belief that he had 25 federations supporting him, which while not enough to win, was large enough to have a say in the final outcome. Makro had also complained to the Ethics commission in the hope of getting Dvorkovich barred from the election. Once this complaint was rejected it became clear that the Makro ticket was in trouble (and they now knew it). The decison to reject the complaint was also an interesting one, as it showed a more independent mindset among some FIDE office holders. One of the issues from 2014 was every disputed case went in Kirsan's favour, which wasn't the case this time. Closer to the actual vote all campaigns began to push a bit harder. Dvorkovich threw a couple of nice functions (one of which had mermaids), while the organisers threw a party for the Makro ticket (as an aside I and others offered to organise an event for Short at the Oasis Hotel where we were staying. This would have involved 8 bottles of wine and 250 Lari across the bar!) By this stage it was becoming very clear that Dvorkovich was close to winning on the first ballot (and he said as much to us). I had planned to attend the whole day of the election, but an error in our team submission meant I had to play instead. I did get to attend the morning part of the election, but had to leave just before the vote began. However this was revealing enough, as the FIDE officials at the front of the room didn't appear that popular. Haiti made a complaint for the floor about how they were tricked out of voting, while the Slovenian delegate had to explain why their proxy was given to Makro the day after the board unanimously voted to support Dvorkovich (A stay in hospital was the apparent reason). Before the vote each candidate gave a speech. Nigel Short Dvorkovich went first, followed by Nigel Short. Short used his platform to criticise the FIDE establishment. However he pulled a rabbit out of the hat at the end, by announcing his withdrawal and asking for a vote for Dvorkovich instead. Apparently this strategy was decided the day before, in the belief that staying in may have muddied the waters ('A GM move' said one person, 'A real d**k move' was another comment). By doing it this way he still had the right to give a speech, essentially making the contest 2 against 1. This seemed to catch Makro flat footed, as he was prepared for 2 rivals, not one. After the speeches the voting took place, and in the end it resulted in quite a wide victory (by 25 votes to Dvorkovich). The Short team thought the difference was in the people who would have voted for them, although I think a couple of federations switched from Short to Dvorkovich. With my game finished I returned to the congress to see a happy Dvorkovich team posing for photos, including with some people who had been on the opposite side an hour before! Overall I thought it was a better election than in 2014, where personal animosity was the main driver. At least this time there were real policies put forward and decisions could be based on that. The Dvorkich campaign tapped in the desire to change things after 23 years, and this was a significant factor. Hopefully this will translate into an improved FIDE, but even if the new admin comes up short, at last the federations now know they are able to effect change at the ballot box, which I think is the most important thing. As I was bust playing most days of the Olympiad, I didn't really focus on what was going on around me in the tournament hall (especially as the Arbiters disapproved of players leaving the board too often). So I'm just catching up with the other games, and looking for what was quirky or interesting. There were a number of 1 move games in the tournament, where players did not appear. In some cases this was because teams did not arrive, chose not to turn up (Qatar defaulted to Kuwait in the final round), or players being sidetracked by the FIDE elections. Of the games that were played I have chosen both the shortest win, and the shortest draw. While short wins are common, short draws are now harder to come by, as there are no draw offers allowed before both sides have played 30 moves. But repetitions are still allowable, and this was how that particular game finished. Last round nerves can be a coach killer. In the case of PNG we had two players who failed to deal with the pressure, and two players who conquered it. One of these players was Tom McCoy who was playing in his very first Olympiad. After a late night team meeting it was decided that Tom was going to suit up for the last round, giving him an outside change to reach 50% (he was on 3/7 at this stage). The decision paid off for the team as he played an excellent game, including choosing a very sharp continuation on move 18. Possibly nerves were affecting his opponent as well, as in the complications there may have been a missed drawing line. Having gained the advantage, Tom played a very good ending, eventually scoring the win, and helping PNG finish with a 'Desmond' (2-2) against Saudi Arabia. A quick update now that I have arrived back home to Canberra. It was a pleasant two day journey from Batumi-Tbilis-Doha-Sydney-Canberra by Train, planes and busses. Now I hope to get some sleep before writing more about the last two weeks. For the 2018 PNG Chess Olympiad team the final two rounds were the ecstasy of victory and the agony of ... non-defeat. In round 10 we played the US Virgin Islands, and scored a big 3.5-0.5 win over them (I gave up the only half point). Then in the final round we were paired with Saudi Arabia, a match that looked challenging for us. Board 1 Stuart Fancy, and Board 4 Tom McCoy then stepped up and collected two points for us. Tom's game was particularly good, deciding on a gutsy tactical continuation that in the end collected him enough pawns to win the game. (As a result he also finished on 50% for the tournament). I let the team down by rapidly throwing away a good position, and needing just a draw for the match win, Rupert Jones missed a one move tactic and went from +0.0 to a lot less than that. So 2-2 was a better result than we expected, but left us feeling we missed a bigger opportunity. Overall the team performed very well, with our game points score of 20.5 ahead of a large number of teams, while out match points score of 7 equalled or exceeded our more recent efforts. In the overall event China did the double, winning both Open and Womens. A full report on this (and many other things) will appear when I travel back to Canberra. The last couple of days at the 2018 Chess Olympiad have been very hectic, with the FIDE election proving to be a big distraction (but more on that in another post). In the chess, the PNG team has 'hit the wall', only scoring 1.5 from rounds 8 and 9. FM Rupert Jones won his game against Haiti as the team went down 1-3, while he was the only half point in a bigger 0.5-3.5 loss to Mauritania. In a lot of instances we had good positions out of the opening, but then lost control of the game and went on to lose. This is probably a combination of both tiredness, and a lack of regular chess at this level. In the Open section Poland are the somewhat surprise leader on 16 points. The 11th seeds have not lost a match as yet, and have played a number of close rivals. The group behind them contains the USA, China, Armenia and England. The Australian team is in slightly positive territory (10/18), with the good news that the two Olympiad debutantes (IM Bobby Cheng and IM James Morris performing ahead of their ratings). China leads the Women's Olympiad by a point ahead of Ukraine, Armenia and USA. Australia is back in mid field, with a damaging loss to Switzerland in the last round partially the reason. The 7th round of the 2018 Chess Olympiad saw PNG score it's second 4-0 win of the tournament. Up against Palau we were rating favourites on each board, but such matches can always be a little tricky. In the end we won on each of the boards but we had to work hard to do so. I had a brain snap after winning some pawns in the opening, where I failed to count a sequence of captures correctly and missed the win of a piece, but my position was good enough to win anyway. Tom McCoy scored his second win of the tournament on board 4, while Helmut Marko and Stuart Fancy won after determined resistance from their opponents. The win puts us up to 4 match points, and 13.5 game points. We play Haiti in today's round, and while seeded above them, this is another tricky match for us. At the top end of the tournament there is now a three way tie between Azerbaijan, Poland, and the USA. The Russian team is struggling back on 10 points, only 1 point ahead of the 33rd placed Australian's. In the Women's Olympiad, Armenia is the outright leader, having inflicted the USA teams first loss in round 7. The Australian team has dropped back to midfield, having faced a number of strong teams as a result of their flying start. Yesterday was the 7th day of the Chess Olympiad, with round 6 being played. PNG continued its run of narrow losses, this time losing 1.5-2.5 to Aruba. We scored a win and a draw on the top 2 boards, but losses on 3 & 4 left us on the wrong side of the result sheet. So we remain on 2 match points, although our game points score (9.5/24) is more than a large number of teams placed ahead of us. The last few days at he Olympiad have also been filled with meetings and electioneering. The attempt by the Makro campaign to have the rival Dvorkovich ticket disqualified from running was rejected by the Ethics Commission, although Serbia has been barred from voting at the election. There is a sense on the floor that Dvorkovich might just have enough votes to win, but if other elections (from say 2016) show, negative campaigns have a lot of sway. There is also the mechanics of delegates and proxies to take into account, with at least two Oceania Federations guilty of 'phoning in' their vote, rather than seriously engaging in the electoral process. Today PNG play Palau in an all Oceania match up. With a brief respite from meetings, hopefully we will be a well rested team, and we can score our second win!